UPGRADES abound in this stunning 2016 Deeb home located in a small GATED GOLF COMMUNITY tucked away from city life, yet close to Suncoast Pkwy. with easy access to all Tampa Bay has to offer. Beautiful DOUBLE LEADED GLASS DOORS with CRESCENT WINDOW above lead to wide foyer with soaring 14 high TRAY CEILING. Youll be awed by the homes openness & the sweeping view of the 14th hole on the golf course. To the left STATELY COLUMNS flank the entrance to the combination living / dining room with TRAY CEILING. Straight ahead is the open breakfast area / kitchen/ & family room with TRAY CEILING & tall collapsible sliders leading to the open covered patio. Custom shades for the sliders offer privacy. RICH ENGINEERED HARDWOOD FLOORING adds to the warmth of this inviting home. 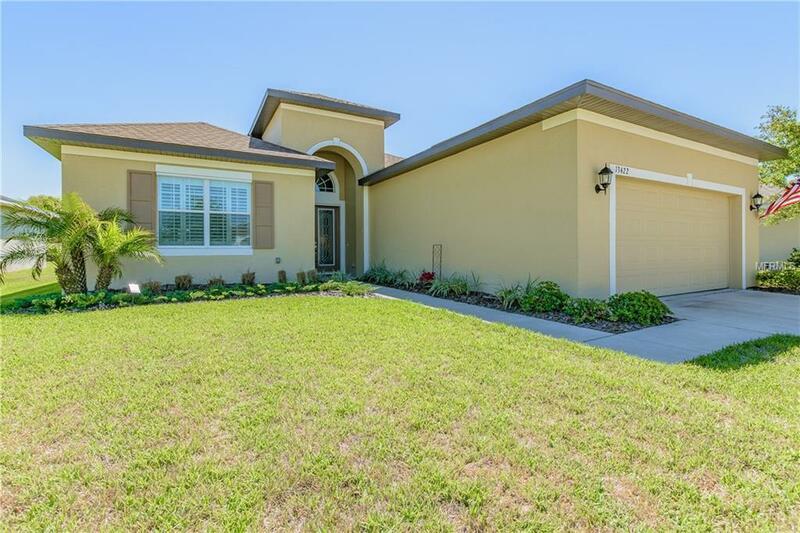 Beautifully appointed kitchen with 42 cabinets with crown molding, SOFT CLOSE DRAWERS, GRANITE, island, pantry, TILE BACKSPLASH, STAINLESS STEEL WHIRLPOOL APPLIANCES including built-in oven and cooktop. The master retreat features DOUBLE FRENCH DOORS leading to the patio, TRAY CEILING, 2 walk-in closets, & en suite with comfort height vanity with dual sinks, garden tub, separate SHOWER FULLY TILED TO THE CEILING, & private facility. Split bedroom plan, inside utility with laundry sink & HIGH-END LG WASHER / DRYER ON PEDESTALS, CUSTOM PLANTATION SHUTTERS THROUGHOUT, VOLUME CEILINGS, 8 DOORS, PLANT SHELVES, DEEP BASEBOARDS further enhance the beauty of this pristine home. All this plus LOW TAXES, LOW HOA FEE, NO FLOOD INSURANCE.